The grim news in Europe continues, this time led by Germany. Bloomberg reports German Factory Orders Slump 5.7 Percent. Orders, adjusted for seasonal swings and inflation, fell 5.7 percent in August, the Economy Ministry in Berlin said today. Economists predicted a 2.5 percent decline, according to the median estimate in a Bloomberg News survey. The data are volatile, and the drop followed a 4.9 percent increase in July that was the most in more than a year. Orders fell 1.3 percent from a year earlier. Export orders dropped 8.4 percent in August, while domestic demand slid 2 percent, the ministry said. Investment-goods orders plunged 8.5 percent and basic goods orders slid 3 percent, while consumer goods rose 3.7 percent. While August orders were weak partly because of school holidays, they were also affected by the slowing euro-area economy and geopolitical risks, the ministry said. 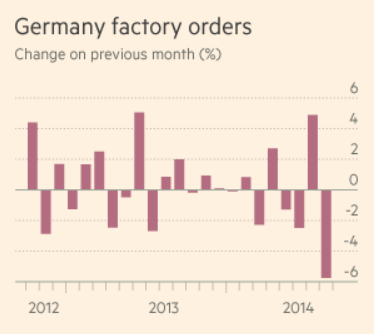 The Financial Times reports German Factory Orders Suffer Biggest Fall since 2009 Crisis. Factory orders fell 5.7 per cent in August compared with the previous month, the biggest drop since January 2009 when demand slumped in the aftermath of the global financial crisis. However, Germany’s economy ministry, which released the figures on Monday, played down their significance, saying the timing of school holidays had influenced the result. Morgan Stanley cautioned clients against “reading too much into a single report” after factory orders rose by 4.9 per cent in July. To be fair, German factory orders are volatile. So let's presume timing of school holidays is behind the July increase and the August decline. With that in mind, let's take a simple average of the last two months. The average result is a decline of 0.4% per month, for the last two months. That process also means four consecutive months of decline. But what about export orders? Is that 8.4% decline entirely attributable to school holidays? No matter how you slice it, the "don't worry, be happy, it's mostly a school-related holiday phenomena" viewpoint is more than a bit Pollyannaish.